Classic Brands Hercules Heavy-Duty 14-Inch Metal Bed Frame/Foundation is a solidly constructed super strong metal bed frame that provides superior support for most mattresses. It is a low-cost alternative to traditional bed frames, foundations or box springs. This durable black metal frame supports every type of mattress and has 13 inches of ample storage space beneath. Ships ready to assemble with no tools needed. It can also fit most headboards and footboards (brackets sold separately). Is it a Foundation or a Frame? This is a common question-the Hercules Heavy-Duty 14-Inch Metal Bed Frame is both. It provides support for the mattress, so no foundation or box spring is required, and it has the rigid surface and legs like that as of a bed frame. If you want to add a foundation, you can do that as well. With ample storage space beneath and caps on the legs to protect your floor, this is a perfect solution to support any type of mattress. 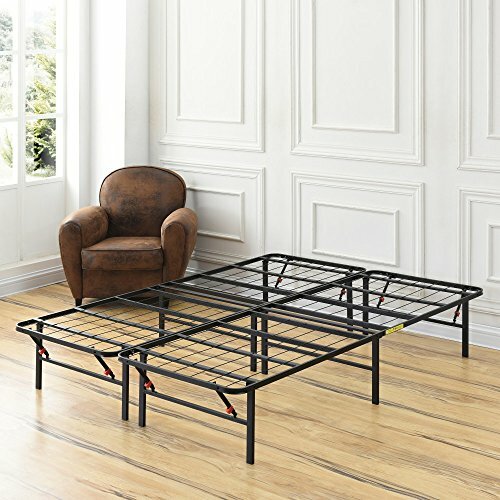 The Classic Brands Hercules Platform Heavy Duty Metal Bed Frame/Mattress Foundation is a great alternative to a traditional mattress foundation. The metal bed frame replaces a traditional box spring, giving your bed a more modern look while creating more room for under bed storage. All standard bed sizes are available, and the metal frame can support any type of mattress - memory foam, latex, or innerspring. It also prevents sagging and increases the longevity of a mattress. The metal foundation has a sleek, contemporary look while providing the ultimate allover support for your mattress with 12 points of contact to the floor. •Step 6- Put your mattress (and foundation if you please) on top and enjoy! It is also a good idea to check the size and the height of your mattress to make sure you are ordering the correct size. Keep in mind that you should combine the height of the frame, foundation (if you are adding one), and the mattress to get a gauge of the how tall your bed will be. Smart packaging reduces the carbon footprint in the manufacturers shipping process. Our advanced packaging technology means we can ship efficiently. The compact package ships in manageable pieces for easy assembly right to your doorstep and fits easily thought tight hallways or narrow stairwells. Classic Brands Hercules Heavy-Duty 14-Inch Metal Bed Frame/Foundation is backed with a 3-year worry-free warranty. If you have any questions about this product by Classic Brands, contact us by completing and submitting the form below. If you are looking for a specif part number, please include it with your message.